The Obama campaign is completely tone-deaf. 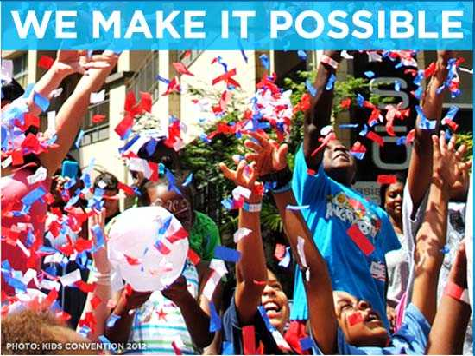 The DNC will be held in Charlotte, North Carolina, and guess what mantra is featured in Charlotte’s banners all over the city during the convention? The last time a four-word phrase became the Obama mantra it didn’t do so well: You Didn’t Build That. Now, that insult to the independent-minded American has been given new impetus by telling people that “WE” make it possible. YOU need OUR help. Methinks ’tis the other way around; the Obama campaign, desperate to maintain its image as a juggernaut, is actually busing people in so they can fill the 74,000 seat stadium where Obama is to accept the nomination. It appears THEY need OUR help. What kind of leader is so insecure that he needs a 74,000 seat stadium filled to capacity in order to cultivate his demagoguery? It’s all about Obama. It’s always been about Obama. It will always be about Obama. In his mind, we are simply the serfs who serve the king.